Projector-reflector solutions from Osram provide uniform lighting and minimum reflection in swimming pool halls. In such applications a projector emits a lumen package that is split via a deflection reflector back into the space to be illuminated without glare. With Floodlight 20 LED and Siteco Mirrortec reflectors, Osram Lighting Solutions offers a perfectly matched system that holds up to challenging ambient conditions, and also scores points with high levels of maintenance friendliness because the projectors can usually be mounted at easily accessible locations. Illuminating a swimming pool poses particular challenges for lighting planners and designers. The uneven and semi-reflecting surface of the water often causes glare and unpleasant light effects. The aim is to create glare-free lighting for sports pools and leisure pools that in turn enables a pleasant atmosphere for recreational swimming, training and competition. Simultaneously, the lighting solution must be energy-efficient and maintenance-friendly and also be able to withstand the difficult conditions caused by splashwater and high levels of humidity in the air. The solution for this is indirect lighting, and to implement this lighting philosophy, Osram Lighting Solutions offers its Siteco Mirrortec System. This is based on a secondary reflector principle, i.e. a projector emits a lumen package that is thrown back into the space to be illuminated via a deflection reflector without glare and with high levels of homogeneity. The Floodlight 20 is used as the LED projector. The luminaire is protected from humidity and splashwater thanks to an IP66 protection rating and has also been tested and certified for chlorine resistance. This makes it ideal for the corrosive and damp environments prevalent in swimming pools and also guarantees a long service life. The lighting solution is also especially maintenance-friendly because the projectors used in projector-reflector systems are usually not mounted to the ceiling but to the side walls, thus maintenance work can be carried out without needing to empty the pool or set up complex scaffolding. Ultra-flat faceted reflectors with patented Siteco Fresnel technology function as reflectors within the projector-reflector system. In 2017 a new swimming pool with a surface area of approximately 4,000 m² was constructed in the Norwegian town of Årnes to the north-east of Oslo. The complex consists of a main hall with a 25 m-long swimming pool, an activity- and children's pool as well as a diving platform with 1, 3 and 5 m diving heights. All areas were illuminated with Siteco Mirrortec systems consisting of Floodlight 20 LED projectors in combination with faceted reflectors. All luminaires used in Årnes are equipped with DALI light controls enabling efficient operation and convenient, individual control of light. "The use of reflectors is exciting. They ensure good general lighting and also create a pleasant atmosphere, and the elegant and slender Osram luminaires have a discreet and inconspicuous appearance," said Leif J. Viken, General Manager of the lighting project with Myhre Elektro. "The complexity of the building was a challenge but the lighting installation could be implemented very well. We believe it’s a particularly good solution." In the large hall, two LED floodlights were mounted on the wall at low heights on each side. These emit narrow distribution light directed upwards that is dispersed by the faceted reflectors into small light points and then guided downwards almost completely without glare and with high uniformity. 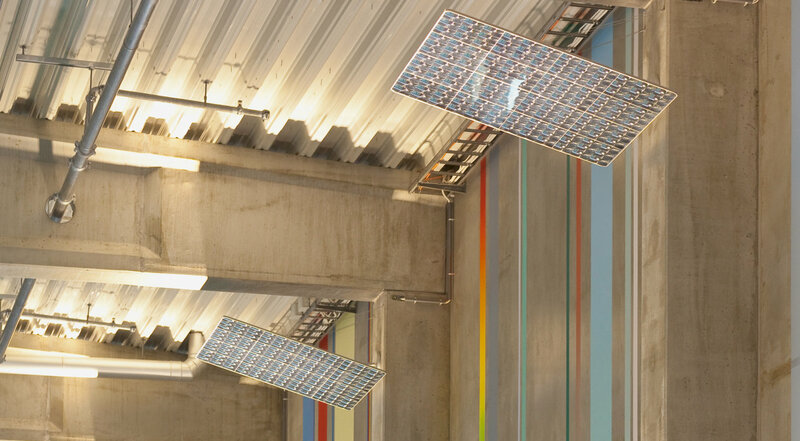 In addition to the high quality of light, the project-reflector system also scores in terms of easy maintenance. "It's quite easy to reach the projectors if technical or operational modifications are needed. They are attached low enough to the walls so that only a mobile scaffold is needed for service," commented Leif J. Viken. Projector-reflector solutions ensure uniform lighting and minimum reflections in swimming pool halls and also feature high levels of maintenance friendliness. In the form of Floodlight 20 and Siteco Mirrortec reflectors, Osram Lighting Solutions offers a perfectly matched system that is also ideal for challenging ambient surroundings.